The chart of year-on-year growth rates pretty much tells the story. Domestic orders in Germany have been weak and declining since early in 2018. The pace of their erosion has been both steady and relentless. But foreign order growth peaked at the very end of 2017; since then, foreign orders have decelerated and the pace of deceleration has picked up. Overall orders fell hard, by 6% for capital goods, while intermediate goods orders fell by 0.9% and consumer goods orders fell by 3.5%. New orders from within the euro area fell by 2.9% while foreign orders from outside the euro area fell by an outsized 7.9% month-to-month. German officials look for this weakness to persist. The 6% month-to-month drop in foreign orders in Germany is the largest drop in foreign orders since a 6.1% drop in July 2015. That drop came in the wake of a 7.1% spurt. This one follows another drop, one of 2.6%. And that pairing is unusual…except in recession. In August 2014, an even larger 7.6% drop came in the wake of a 10.2% foreign order spurt. In November 2011, a slightly smaller 5.6% drop followed a 3.7% gain and was itself followed by a 3.7% gain. In the Great Recession, German orders showed back-to-back weakness with foreign orders dropping by 8.8%, 5.9%, 6.3%, 9.4%, 11.3%, and 0.7% in consecutive months from September 2008 through February of 2009. June 2008, still in recession, a 6.1% decline in foreign orders came after a 2.2% drop in May. But in July 2007, while not in recession, old trends were back in play with a 6.4% month drop preceded by a 4.8% rise. In December 2002, a 6.5% drop came after a 4.2% rise. In January 2001, a 6.8% drop in foreign orders was preceded by a 3.8% rise. A 6.3% drop in January 1999 was preceded by a spurt of 8.7%. That covers the last 20 years or so of 6% and larger drops and more. These results show large drops in orders over the last 20 years when the German economy was not in recession. 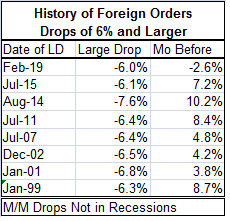 During expansions, foreign orders did not have a 6% or larger order drop unless the drop was preceded by a gain of at least 3.8% (average gain is 6.8%; median gain is 7.2%) in this period. In these seven previous cases, the order drop was to restore 'trend' growth after an excessive spike in order volume. In only three of seven of these episodes did orders fall more than they previously had risen. Back-to-back order declines involving an order drop of 6% of more has been a recessionary phenomenon over the last 20 years. The latest back-to-back foreign order declines involving a drop of 6% of more is unusual and so far unique in that regard. So is this a recession signal? The foreign order signal is an important one for Germany since exports are 50% of GDP. The German economy is very different from the U.S .economy in that regard. This signal would affect a large portion of output in the German economy. So far, the PMI signals for German manufacturing are remaining very weak and still deteriorating. But the service sector reading for Germany has stabilized. If trade were to 'cause' a recession, we would need evidence that the malaise were spreading. Moreover, the German construction sector continues to emit very strong signals that seem inconsistent with recession. Still, the event of consecutive large foreign order declines is not to be ignored. It may be that recession forces are still gathering. It may be that next month will bring a strong rebound in foreign orders and put this large drop in a different context. What will be, will be… and for now we are left guessing and we will be rewarded only for assembling the relevant facts. For now German foreign orders are progressively deteriorating, dropping faster over shorter periods. Domestic orders show their largest drop over three months but the deterioration there has been more 'steady' than progressive up to this point. Both foreign and domestic orders are falling in the quarter-to-date. Real sector sales are not complying with this deteriorating trend. They are, in fact, showing their greatest strength over three months with capital goods demonstrating progressive acceleration in sales. Also real sales are for the most part doing well in the quarter-to-date period. While orders are leading and sales are only 'coincident' there are still mixed signals here about the German economy and where it is going. Of course, the economy is getting buffeted from overseas weakness and domestic fiscal policy is running a surplus, another source of growth reduction or containment. But monetary policy remains expansive from the ECB. The German economy is caught in several cross currents as well as the unknown vortex from Brexit. While the foreign order weakness may not be a harbinger of a recession to come, in no way is it good news.